Looking for an entry-level tennis shoe? Wilson’s Advantage Court IV offers a great combination of comfort, support, stability, and versatility–all in one wallet-friendly design. 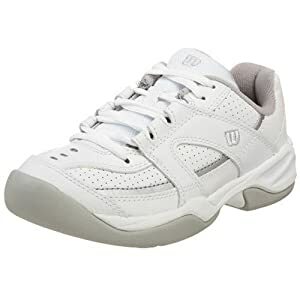 Limited Sizes Available.Wilson Advantage Court IV Women`s Tennis Shoes The Women`s Wilson Advantage II is a top performance shoe with updated technologies to meet the expectations of tennis players at all levels. For a more anatomical fit, this shoe is constructed with `s Contoured Last technology that gives the sensation of a snug and secure fit all around the arch and forefoot. For better cushioning and performance, theAdvantage II shoe is designed with EVA technology. EVA helps to achieve a responsive cushioning system. Tennis players are guaranteed to be provided with exceptional court feel when playing in the Wilson Advantage II`s. Check out our collection of to match these shoes for a complete outfit. 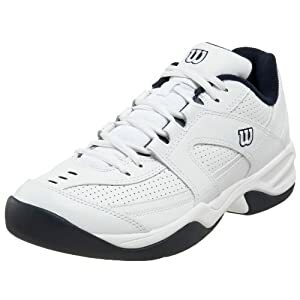 The Wilson Advantage Court IV Junior is the latest offering in the Wilson’s junior shoe line and offers a solid, all-around court shoe at a great value.Color: White/SilverFull grain leather upper.Cupsole Contruction.Abrasive, non-marking rubber outsole. 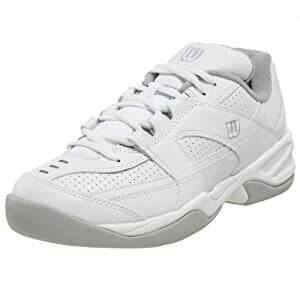 Limited Sizes and Quantities Available.Wilson Advantage Court IV Men`s Tennis Shoes The Wilson Advantage IV is a top performance shoe with updated technologies to meet the expectations of tennis players at all levels. For a more anatomical fit, this shoe is constructed with Contoured Last technology that gives the sensation of a snug and secure fit all around the arch and forefoot. For better cushioning and performance, theAdvantage IV shoe is designed with EVA technology. EVA helps to achieve a responsive cushioning system. Tennis players are guaranteed to be provided with exceptional court feel when playing in the Wilson Advantage IV`s. With the simple and traditional colors of white, navy and silver, these shoes are easy to pair up with any of your existing outfits.